Some bad personal news, an upcoming conference (which I may or may not be able to attend) and all sorts of upcoming stuff means I'll likely be off air for a week or two. Thank you to my regular readers for being, well, regular readers, and I always appreciate your comments. I'll be back sooner rather than later I hope. Things have gone remarkably well, so well that I'm confident enough to give a talk next week to a hundred plus astronomers and engineers although I haven't quite figured out what they want to hear or what I want to say to them. Should be an interesting meeting nevertheless but this isn't want I wanted to talk about. What I do want to point out is a remarkable statistic that has caught me by surprise. In fact I'm astonished, but this is all down to our amazing engineering crew. Like most professional observatories UKIRT keeps track of its fault rate. It's defined as the loss of clear time available for science observing that is due to technical faults. 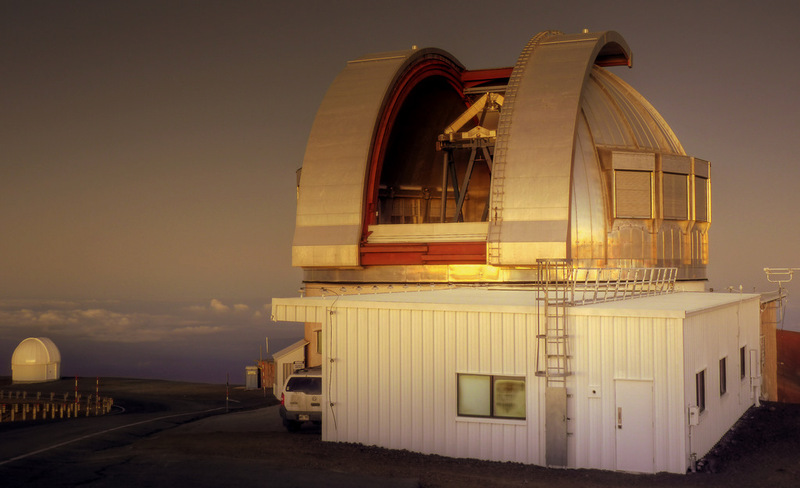 Many observatories run at a fault rate of 5% which is seen as very good. UKIRT, for many years now, has run at around the 2% level. This is exceptional especially given its remote location on top of a 14,000 foot mountain which suffers arctic-like conditions for much of the year. With the switch to remote operations I fully expected this fault rate to increase and quite significantly so. We did everything we could to make sure all our known failure modes could be fixed remotely but there are some that simply can't be dealt with that way. To make things worse, in an El Nina year like this, weather conditions can be so bad at the summit that 1) they cause serious faults through icing, high winds, water inundation etc., things sensitive electronic devices hate; 2) the weather causes so much lost time that any small fault invariably loses more time as a percentage of clear time than it would during the summer and 3) our reduced staff numbers would mean faults would take longer to fix. Despite the list, the fault rate continues at around the 2% level and if I leave out one serious fault that was a one-time failure and had nothing to do with remote operations, our already exceptionally small fault rate is now down at the 1% level since remote operations began. This is not what I expected, am still somewhat befuddled by it but am proud to announce it. This is all due to an exceptional group of people that work at UKIRT and the JAC, especially our engineers and technicians but it's also due to the community that use UKIRT. Tomorrow I hope to post a comment or two from our observers that show what a special place this is and how many great scientific careers UKIRT has launched. It's knowing that we still contribute in that way while still making new scientific discoveries each night that keeps us motivated. Don't worry, I'll get through this phase in my life soon! Seriously, I'm actually being a good scientist and just experimenting with the new toy. 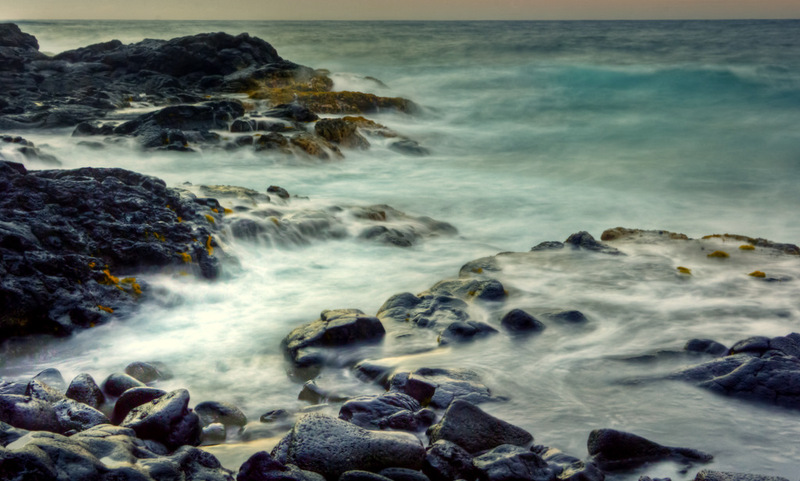 For pictures like this, a 0.3 to 0.4-sec exposure seems to be perfect for capturing the movement of the water but not always enough to capture the dark lava rocks. Anyway, think I have something to work on now! Both pictures were taken at one of my favourite places on the planet, the Puna coast between Kalapana and Kapoho. It was sunset but since this is on the east side of the island I wasn't going to capture a glorious sunset from here (sigh, I miss the summit of Mauna Kea!) but when the light starts to dip at least it allows for some longer exposures which gives one an impression of movement in the water. Not sure what to move onto next. Someone suggested historic Hilo buildings. That's an idea I'll look at but am not sure what's historic or not and in any case I'll still be pining for my sunsets! I'm a realist and an atheist. I don't think there's any reason we live here other than we just do. I've little time for new age philosophies, will give you an evil look if you say my chakra is misaligned (or my stars) and believe karma only exists for those that believe in a virtual reality, and I'm not one of them. Having said that, there is a special place here on the Big Island of Hawaii I'll visit when my chakra and karma are all messed up and my energy vortexes and dilateral cosmic planetary alignments aren't what they usually are. Even when they're retrograde. Oh, enough of that. My virgo star sign karmatic dispositional synergies and photonic conscious polar-energies are telling me it's time to go to bed. 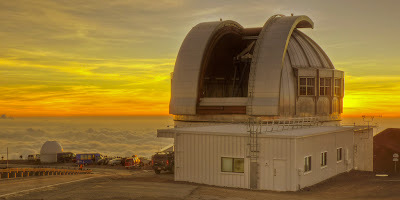 For the last couple of years this blog has been filled with sunset shots from the summit of Mauna Kea. Well, I can't do that now, so as some of you may have noticed I've been trying one or two other things. Practise makes perfect as they say and think I'd figured out how to deal with that superb Mauna Kea light when the sun was setting, but now I'm in a new environment and have yet to get to grip with things. Still, I think I may have found my sunrise spot if I ever feel like waking up at 4am (it happens every so often, sometimes not by choice!). There's actually a great place almost within walking distance from home but you've seen that photo and I want to find something else. 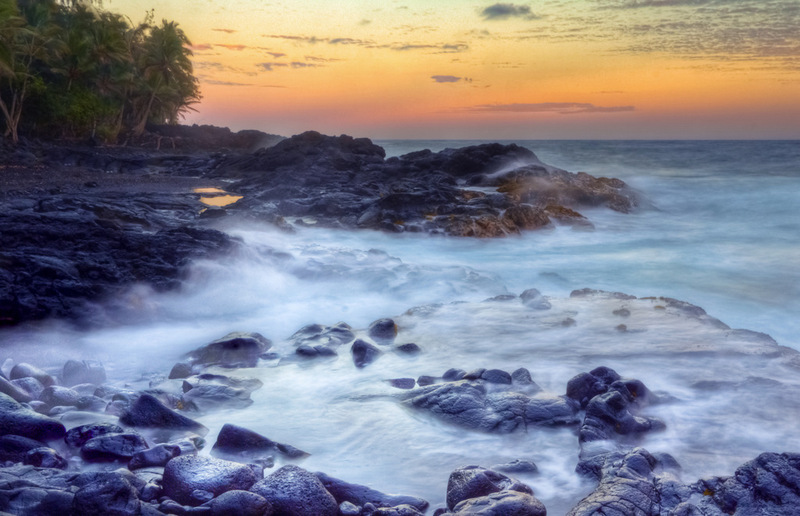 About 40 minutes away by car is my favourite spot on the island, the Puna coast between Kalapana and Kapoho. I often go there just to relax and get away from the stress of work and everyday living. It is an extraordinarily beautiful and peaceful place but have yet to visit at sunrise when I'm sure it's even more stunning. Anyway, just a quick navigational sortie today - remember this is on the east side of the island so not that great for sunsets. It's not a bad place for whale watching either, but I think they saw me with my camera, so that was the end of that. 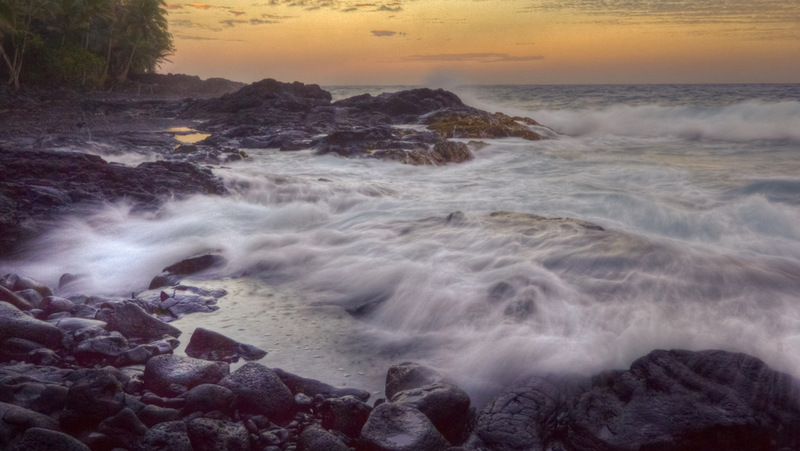 A friend of mine on the Big Island noticed I'd missed something in a recent picture I took. I have no idea how I didn't see this. He saw something similar in another picture of mine and it seems I had inadvertently intruded on her privacy so it's not really appropriate for publication here. Thanks, Greg. 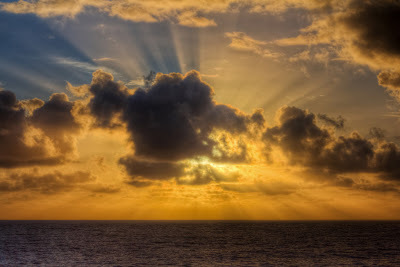 Actually, it's dark right now and it's the evening, but I love the magical crepuscular rays in this sunrise shot from last week. Taken from the Puna cliffs near my home. A couple more black and white shots from Laupahoehoe Point on the Hamakua coast of the Big Island. 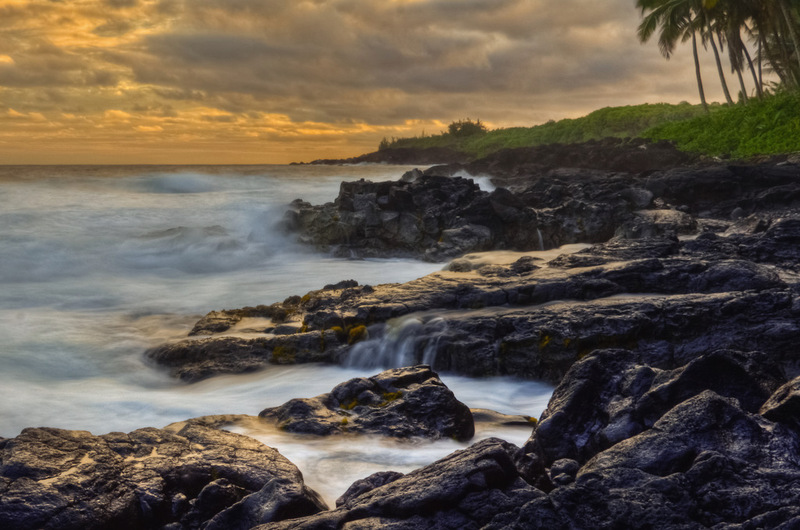 This is one of the most beautiful spots on the Big Island that often gets overlooked by visitors but also has a tragic past. On this evening, as I mentioned before, the thick vog and clouds made everything look so dull there were no colours to portray and even if I tried (and I did!) it looked wrong. So resorted to catching the movement of the water instead. Apologies if you don't like black and white but sometimes it works better. I prefer colour myself! Laupahoehoe Point last week. 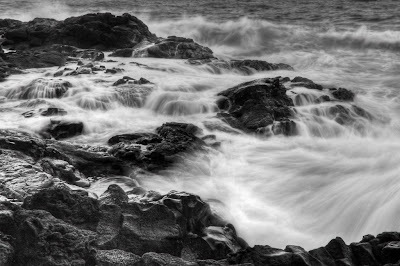 The surf was up as was the vog and cloud which made everything really dull and not very photogenic - you would have had a hard time telling the difference between a colour and black and white shot. So I took a liberty; B&W and tonemapped one single raw file. There are one or two things that I need to fix but it looks quite nice to me. These are a couple more spectacular photos by Paul Hirst taken from inside the UKIRT dome. As I mentioned in my previous post Paul used to work with me at UKIRT but has since moved to a position at Gemini although since their northern hemisphere office is literally a few yards from ours, I still see him quite often! This is "before" although that's not entirely accurate (WFCAM had arrived when this shot was taken), but shows the telescope in "Cassegrain Mode". If you click on the picture you'll see a lot more detail. 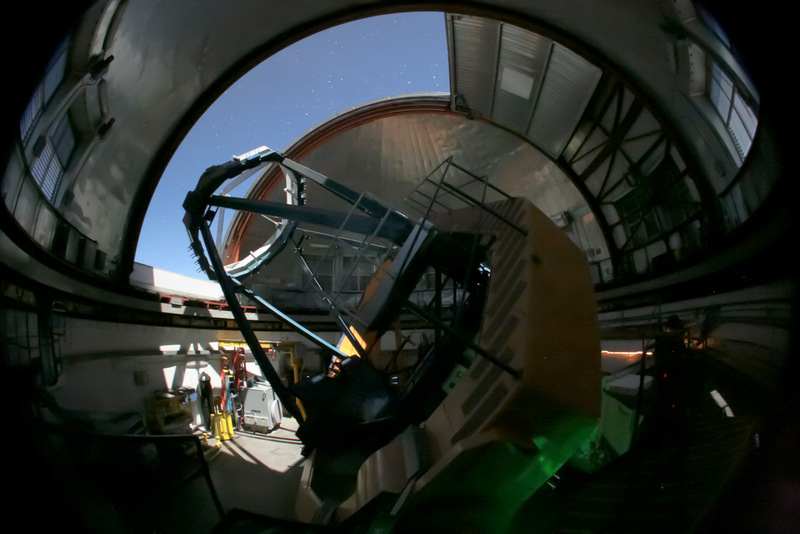 The scientific instruments, plus the guider and wavefront sensor are hidden out of sight, below the primary mirror, at the cassegrain focus. (Blogger's spell checker is suggesting I change cassegrain to casserole by the way - don't think I will). 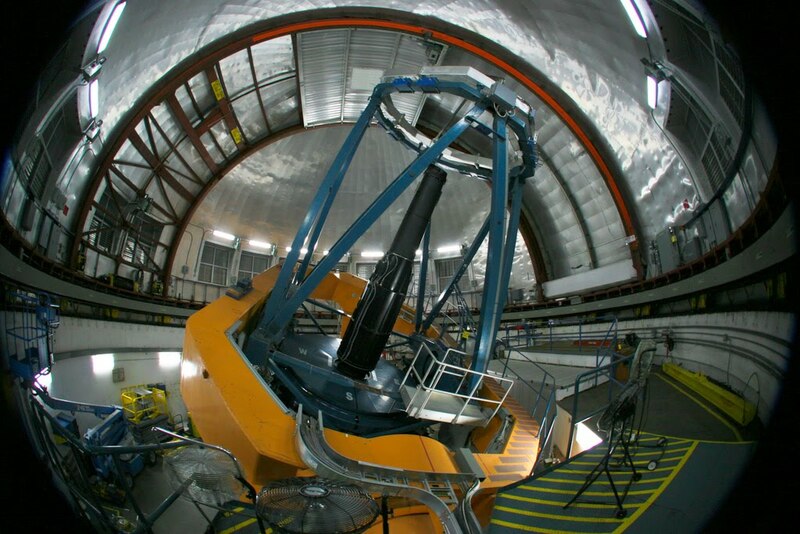 WFCAM is actually positioned on top of the primary mirror. This is an extremely unusual arrangement for a major telescope but in order to do wide-field imaging the instrument needed to be put at the prime focus, so this is where it ended up and is still there tonight. As I write this it's observing our Galactic plane and taking data astronomers will use for decades to come and will likely launch many careers. Well, there you go, anything to disguise the fact that I took the most boring and uninteresting photos on Laupahoehoe Point today and just can't find a way to post any picture I took and make it look good. So thought you might like Paul's instead! PS. Looking from the outside, UKIRT looks so much more serene - you wouldn't know what's going on in the inside! Photo by Paul Hirst, published with permission. The last few years have been quite traumatic both personally and professionally. I hope to publish some relatively good news in the next few weeks on the professional side of things. What I can say right now is that it looks as though the number of publications resulting from UKIRT data in 2010 has smashed the previous record. If this turns out to be correct it will be a stunning result for the telescope I've spent most of career at. UKIRT has been threatened with closure all its life but the threat became very real in the last couple of years. 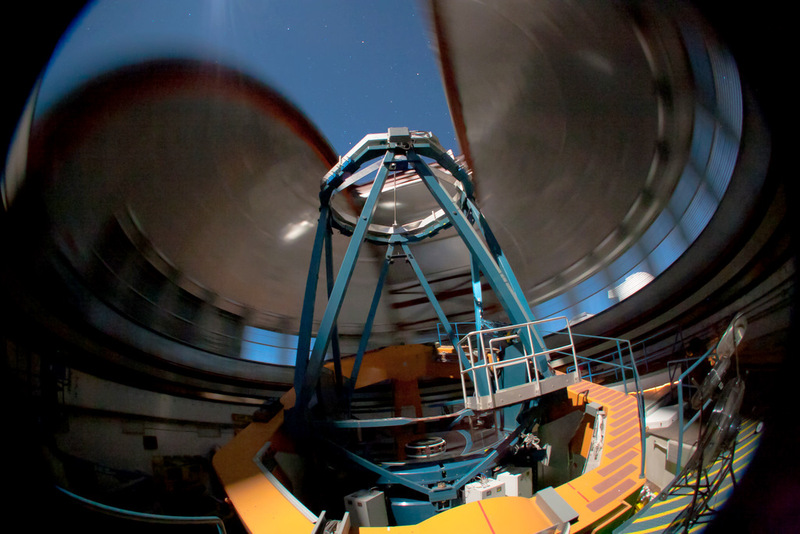 Despite this, it now looks as though the telescope is more scientifically productive than it has ever been. The photo above was taken by my good friend and colleague Paul Hirst. Paul worked with me at UKIRT for many years and then left for a position at the Gemini North Telescope (but he still takes time off to comment on this blog every so often). He takes wonderful photos and there are a couple more I'll post from him of UKIRT which are even better than this one. But only if he buys lunch next time! I'm running out of photos since I haven't taken any the last few days, but it has given me a chance to play around with Lightroom for an hour each evening learning some of its features. I have to say it's one superb piece of software although I haven't got my head around many of the image processing tools yet and often find myself being confused by what I just did! Anyway, another photo from the other day at Keaukaha Beach Park in Hilo. This picture was underexposed because it was becoming quite dark and to expose properly would have meant the water movement would have been smoothed so much the feeling of water rushing towards me would have been lost. Completely blurring out water movement often works really well (see some of my photos from the last few days) but it can also result in a loss of a sense of movement in a picture. At least that's what I think! And what do I know? I'm still an utter amateur at this game. The problem with underexposing is that the dark lava rocks here really do look black in a picture so tried to bring back the actual brightness and colour I saw with my eye using Lightroom. Of course, dealing with the noise of under-exposed blackness brings other problems! This is defintely a photo where a graduated ND filter would have helped and HDR techniques would have messed everything up. Still, I really do like the water in this one. It's been two months since I was last at the summit of Mauna Kea. I knew this was going to happen with the change to remote operations, but I can't tell you how much I miss the place. 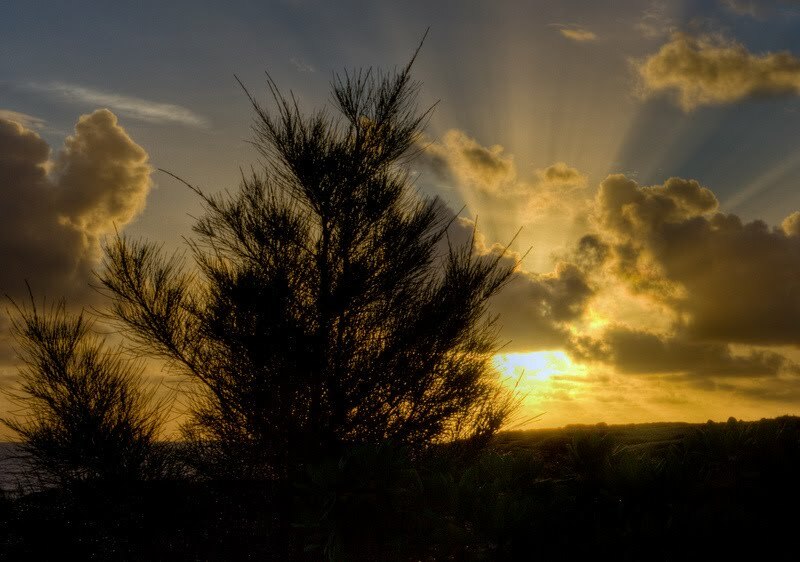 Well, at least my few readers won't be subjected to picture after picture of sunsets from the mountain, so thought I'd start boring people with Puna sunrises instead. Only joking, but I need to find a new outlet. 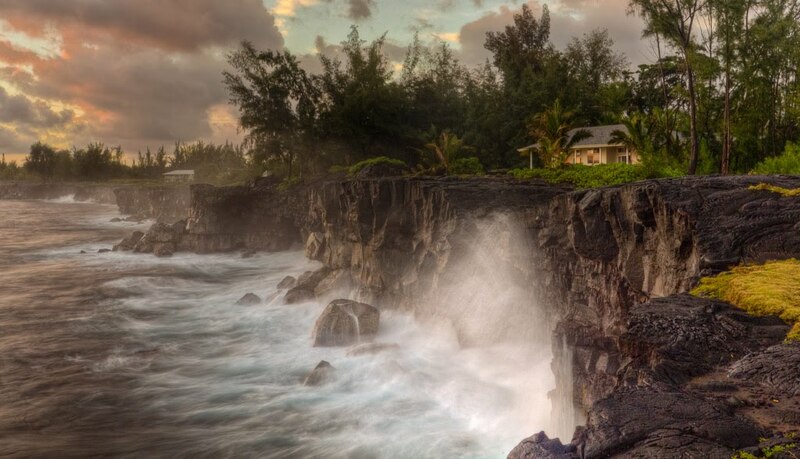 The thing is, I don't think I can take a better picture of Puna than the one in "Cliff watching", but here are two or three more from that morning (but nowhere near as good, aesthetically or technically). I'm not a morning person so please bear with me. This is a very beautiful place but sometimes only comes out at sunrise when the light is just right. Same location as the cliff watching photo, just in a slightly different spot and well before sunrise, so it's a very long exposure (15 secs). There's enough light to illuminate the cliffs though and smooth the water. 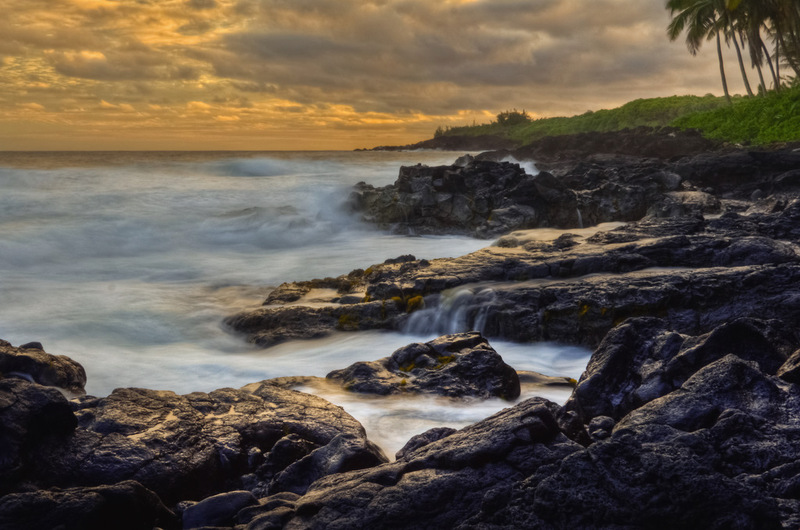 That lava rock really is dark but seems to become a little lighter at dawn. 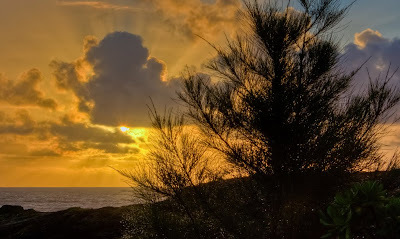 I've tried to get a panorama of the sunrise on the cliffs near here for the last two years. It's never worked - too much water for the stitching software to do its job, and when I finally get the software to work, I hate the picture. Oh well, never mind, I've other things to worry about! On Sunday 6th Feb, Professor Walter Steiger, astronomer, was killed in a traffic accident in Hilo. I didn't know Walt very well, I only met him a couple of times, but it's clear that he was a well-loved person in both the astronomy and local communities and his passing has shocked and saddened everyone. 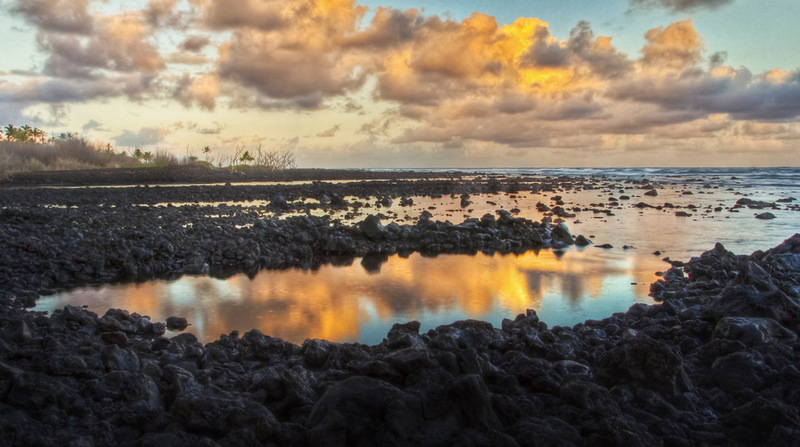 Walt was a pioneer in astronomy and was extremely influential in bringing modern astronomy to Hawaii and making it one of the most important places in the world for observational astronomy. Many of us working here now probably owe our current careers to Walt so this is especially sad news to our community. I'm sure all those connected with astronomy in Hawaii, those that were taught by him and those that simply met him will be thinking of Walt, his family and friends. I wish I could have called this post "Whale watching", but it'd be a very boring post. As ever, although I know humpback whales are out there because I hear them every evening, they won't appear when I'm out watching for them. Oh, sure, there's the joker who knew I'd just arrived on the cliffs and waited for me to get out of the car. Just in front of me, a hundred yards off the cliffs, the bugger breached big style because he knew I didn't have my camera ready. Once I'd got myself set up, and admittedly that takes a little longer than it used to (my old camera had few buttons and didn't need a lense to be attached to it) he'd dived and was long gone. I say male because I think he was alone and that tends to be the way here - females have calves so if you see two whales or spouts close by it's almost certainly a mother and calf. Off in the distance I could see several pairs of spouts from mothers and their children but they were too far away. I took a few photos anyway but they would compete for the most boring photographs ever of distant smudges. At dawn this morning I was awake and thought I'd surprise the whales since they know I tend to look for them in the evening, but they'd all buggered off. So I took a picture of the cliffs instead. This is a few hundred yards south from where I live. It's a great spot for whale watching unless you bring a camera. I thought about calling this post "A quick exit" because that's what happened. 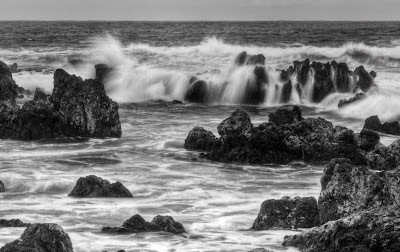 Literally a second after taking this picture the wave was over the rock I was standing on and I grabbed the camera and tripod and made my way off this rather exposed spot via my exit route. Actually, it wasn't quite as dramatic as it sounds, the ocean was pretty calm until this set of waves came in and even they were pretty small, but enough to make me very wet and probably destroy my new toy if I'd just stayed there. In fact I thought I had ruined the shot by grabbing the camera before the exposure ended (it was a 1-sec exposure, f/22 for the geeks) but as I found out later, I'd timed it perfectly. Both pictures here are the same by the way, I just converted one to black and white because I like the way it looks. 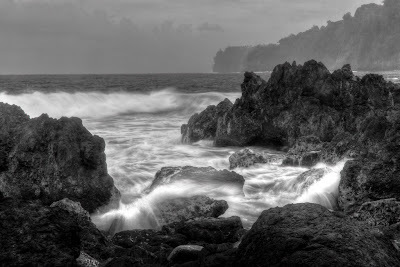 Despite it being a typical Hilo evening - calm waters and and a few showers, the black and white photo makes it look more stormy, whereas the other catches the colours of the rocks, ocean and sky. Over on the left someone was watching me during the whole hour I spent here. I'm not sure why, maybe they were just waiting for this moment. I've been here too long, however, and know never to turn your back on the ocean. Even calm waters can surprise you every now and then! 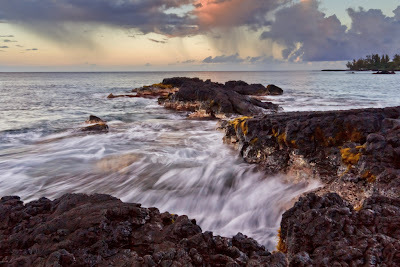 I actually came to this place (Keaukaha Beach Park, Hilo) hoping for some rainbow pictures because as you can see there were showers around and thought I might be lucky. Well, I did catch a couple but unfortunately they weren't particularly impressive. So ended up catching and dodging the waves instead. There are no street lights where I live and the atmosphere is generally unpolluted. With no big cities nearby the sky is often incredibly dark and your eyes don't even have to be dark-adapted to see a glorious view of the night sky. Tonight wasn't the best, there is a little vog in the sky from Kilauea due to the southerly winds but most of that is west of here. So out came the camera because although I tried this kind of photo before with my old point-and-shoot, with very disappointing results I might add, I wanted to see what this camera and lense could do. OK, so I whacked up the ISO to its maximum resulting in a lot of noise, but at least you can see the night sky from my front porch. Orion is just below and right of centre, the belt, sword and the famous M42 nebula are easily visible. Just above the centre is Betelgeuse which seems to be making the news recently as it may well go supernova in the near future, well, anytime from tomorrow to the next few million years. At the bottom left is Sirius, the brightest star in the night sky. 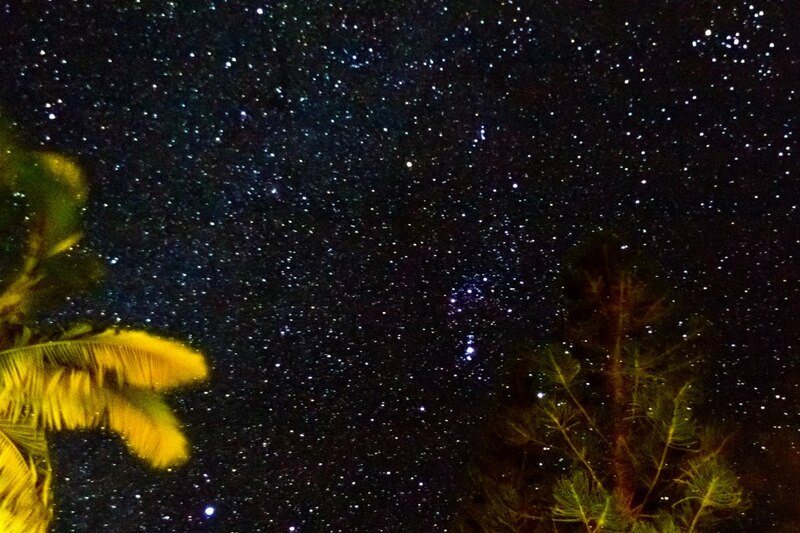 Top right is Aldebaran, trying to hide behind my Norfolk pine is Rigel and just to the left and above Orion is a hint of the Galactic plane. Between Sirius and Orion is the Red Rectangle, an object I spend much of my limited research time on, but I'm afraid it's far too faint and small to be obvious in this photo! Jeez, I think I've just exhausted everything I know about real astronomy! Yes, I'm British. Am I excited about the upcoming royal wedding between William and Kate? Well, I'll leave that up to you to decide, but Clarke and Dawe might give you a clue. I know I'm late with the news, just like her majesty's government in paying some money they owe me. If there's one thing that drives photographers nuts in Hawaii, it's trying to take photos that include black lava rock. It is light-suckingly impossible to expose for the blackness of the rock and also include the ocean and sky. One way to do it is to use graduated ND filters but sometimes even they aren't good enough plus I don't have any (although I think I'm going to have to invest in a set soon). 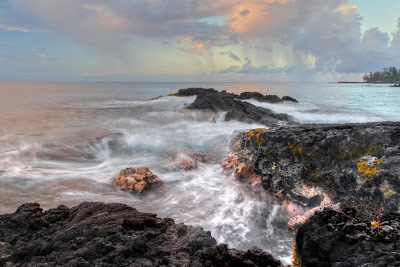 HDR photography is the only other way I know to deal with the problem but that comes with its own problems, especially when the picture involve water or clouds. You can get a picture that looks OK but end up with some peculiar effects in the details, just like the picture above. Oh well, it's OK, just don't look too closely! It was taken close to the hot ponds on Puna's Red Road. I'd have got closer to get the full reflection in the rock pool but have you ever tried to walk across this stuff in low light with only slippahs (flip flops) on your feet? And carrying an expensive camera only two weeks old? Well, I tried and gave up very quickly!